These books are parts 5 and 8 in a series conceived by Martin Lorenz and Lupi Asensio of TwoPoints.Net, whom I got to know through our collaboration on Type Navigator for Gestalten. 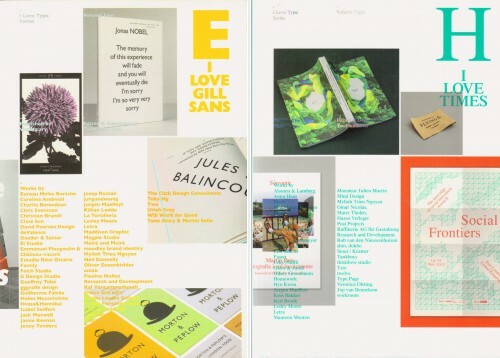 The books are collections of recent and mostly trendy graphic design pieces; each volume focuses on one classic typeface (Futura, Avant Garde Gothic, Bodoni, DIN, etc.) and is an informal inventory of the ways contemporary designers approach and appropriate faces from the past. Each book has a short foreword that is supposed to introduce the typeface to a (supposedly) young audience, and I wrote these two. The Gill introduction was about the historical background of the typeface and its relationship to both Johnston’s Underground typeface and Gill’s broader body of work. The historical foreword to the the Times book was written by Monotype’s Allan Haley; which gave me the opportunity to write a more speculative little essay. In it, i tried to analyze the frequent use of Time New Roman as a “faceless” type because of its peculiar position as a default system and web font — a hegemony among serifed faces which is now slowly coming to an end.